SAL DeTRAGLIA'S VIRTUAL TAPAS BAR: TONGUE TIED. It has happened again. I’ve just had a five-minute conversation in Spanish, without knowing what the hell we talked about. This time it was with Sonia—the woman who owns the beauty salon in downtown Cabanillas del Campo. She snagged me as I passed her storefront, en route to Bar Gema for a café con leche. This much I know—she wanted me to relay a message to my wife regarding a scheduled massage. But that’s all I know. Sonia: Tikkity takkity tikkity takkity your wife’s massage tikkity takkity tik. Sal: How pretty they are the large red bird that she flies across the pretty blue sky that is here in this day of very sunny and hot temperature in our town today. Sonia: Tikkity takkity tikkity takkity so please tell her what I said tikkity takkity tik. Sal: It is him, how do I say it, that the pretty green telephone takes for herself a very big bowl of potatoes. Sonia: Great! Thanks, Sal! See you later! At least, that’s how my brain processed the conversation. I can’t speak for Sonia, however. She seemed—much to my surprise—thoroughly satisfied with the outcome of our chat. She smiled appreciably and displayed none of the eye-rolling or tongue-clicking to which I’ve grown accustomed during past flirtations with conversational Spanish. Perhaps I unwittingly complemented her on her clarity of skin and firmness of thigh. Anyway…the point of this tale is to illustrate that, after five years of total immersion, my Spanish-language skills remain almost as bad as those of President Bush. But alas, the joke is on me. And humiliation has come from a most unexpected source: my two year old daughter, Inés. Inés: Papá! I want to play in the charco. Wife: It’s a puddle. You might also be interested to know that “hola” means hello and “adiós” means good-bye. But the humiliation hasn’t ended with vocabulary. Inés’s mastery of Spanish grammar—including verb tenses and reflexive pronouns—surpassed mine around the time that she graduated from diapers to underpants. Such is my dilemma. But what is the solution? My wife and I have slightly different opinions on how to address my linguistic shortcomings. Hers is that I should enroll in Conversational Spanish lessons at a nearby language school, and also participate in our local library’s Spanish-language reading group. Mine is that I should give up. And Inés’s? Well…she told me her opinion last night during dinner. But to be honest, most of it went over my head. Sal, hace mucho que no leia tus blogs y esta mañana me reí a mandíbula batiente con el último, por lo que he decidido que de ahora en adelante olvidaré el inglés y te hablaré en español, con un sentimiento parecido al tuyo: en breve tiempo Inés me habrá superado. Nah! My Spanish really IS that bad. Spanish lessons would be a practical gift. But, ya know...it just doesn't rise to the level of an ice-maker. Oh my god. So funny. And it brought back horrifying memories of my recent two quarters of Spanish under the tutelage of the Paragayan profesora from Hell. She could give your daughter a run for her money. At least you have the excuse of a bad profesora. What's mine? I've lived for five years in a place where 90% of the population speaks only two words of English--and those two words are "Coca Cola." Yet my only area of Spanish-language fluency is food/drink Spanish. In this respect, I guess I'm kind of an "idiot savant" Although many would dispute the "savant" part. Amigo, I feel your pain. I've been in France for 2 1/2 yrs and sometimes I feel as though I just got off the boat. The good part is that as soon as I'm out of the country and I hear French I realize I know it. (or at least a bit of if). Don't give up! Thanks for your empathy. My wife, however, would argue that I don't deserve it...because my poor Spanish is a self-inflicted wound. I don't get out and converse enough with the natives. Of course, my counter-argument is that I don't talk much in English either (DUH!!! That's why I'm a writer!). Anyway...whatever frustration I feel, must be 100 times worse for you. 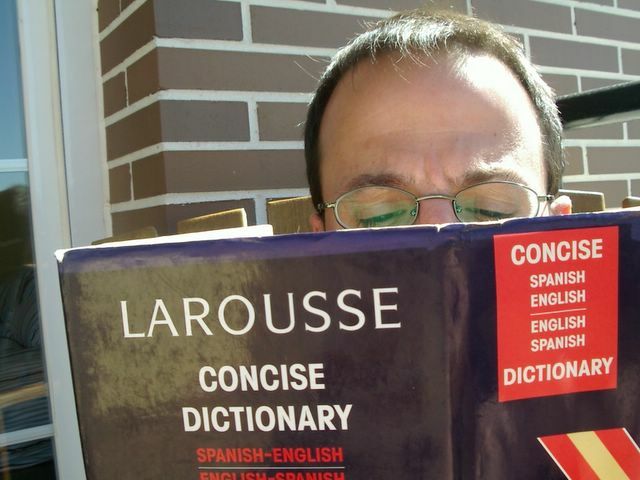 Spanish is a relatively clear language (to the ear, that is) compared with French. I hear "tikkity takkity tik." You hear "shooshitty shishitty shoosh." Oh well...at least we both live in countries that have good wine. In the end, that's the important thing. Mmmmm, I was about to say nevermind, don't punish yourself but... No, go ahead, punish yourself. You deserve it. I agree with your wife: you should go for a course in conversation. It's funny how the Commenters are divided. Those who've never met me are of the "It's OK, Sal...don't worry, be happy!" camp. But those who DO know me (Freddy, Fernie, wife, etc. ), are of the "You lazy, snivelling, mono-linguistic louse!...Stop complaining and start studying!" camp. ¡Vale! Me matriculare' en un curso de "español para extranjeros." Pero...¡no me quejeis si sufran tus niveles de ingles! You should force yourself to speak spanish all the time. Even if you haven't got a clue. I moved here 1 year and 4 months ago, and my colleagues say I speak better Spanish than them. ¡Leche, Sal, este blog ha sido el más comentado! Eso indica que tu español se ha convertido en un asunto de interés mundial!!!! Por ello, adelante tío, colega! Para darle la razón a Sal en su conclusión de que los que le conocemos pensamos que es vago y no se esfuerza lo suficiente, yo, su santa, confirmo y reafirmo esta opinión. Aún así, debo confesar que me alegro... De otra forma no podría practicar inglés a diario!!! !